Efforts to monetize web content have largely failed in the past, with users preferring to switch rather than pay for information. Earlier this month, Google Wallet expanded its micropayment capabilities to include web content. Websites can now set up their pages so that users can sample some portion of the web content and then see a banner (bottom figure) that tells them that seeing more of the content will require paying a fee. The system also works for buying other types of products over the web. Publishers have long sought ways to compensate themselves for their web content. “Google Wallet for web content is an experiment to see if users will be prepared to pay for individual web pages if the buying process is sufficiently easy,” notes Google on its Wallet for Business page. Initial participants in this “experiment” are Dorling Kindersley Ltd., Oxford University Press, and Peachpit Press. Google promises that, by bringing content online, companies will expand their audiences and increase revenues while giving users a method of “instant refunds and rich previews” with just a simple click of their mouse, once they are signed up for the service. Google Wallet, a free Android app on Google Play or other Android stores, allows your smartphone to act as a “virtual wallet, so you can tap, pay, and save using virtual versions of your credit cards, rewards cards, gift cards and Google Offers. It securely stores your credit card information on your phone by isolating your credentials from malware. When you checkout at traditional brick-and-mortar stores that accept Google Wallet, you can pay by just tapping your phone at the point of sale.” The Wallet also includes advertising or incentive offers as well as GPS and location information. Early reviews of the general product through Google Play have been very mixed, with complaints revolving around the speed of the services and the difficulty in using it even on the Galaxy Nexus. Google Wallet—minus the web payment feature—is available in 160 countries. Adding web content to its financial services platform should only increase Google’s reach. This latest update includes security and battery life improvements. Originally, Google Wallet stored user data on individual cellphones; however, in the latest update of Wallet, sensitive data is now stored on a “highly secure” server at the Google site for greater consumer protection. 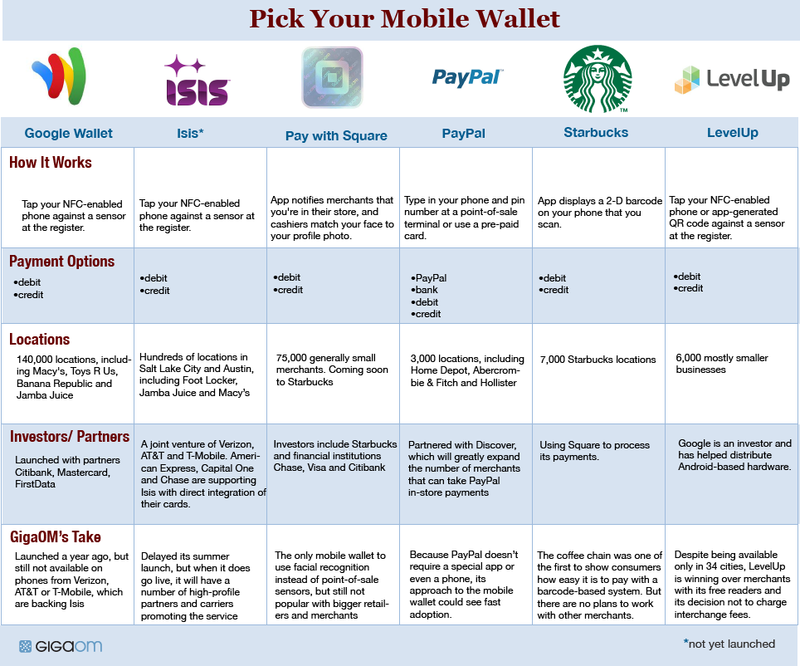 And, these are not the only contenders for mobile wallet services. At least seven other systems are currently available in the U.S.—all with competing platforms and different sets of backers or supporters. Mobile banking or micropayments allow people to use their smartphones to either store money on the devices themselves to be debited electronically instead of using paper money or store critical information from their credit cards or other financial assets to have purchases applied to their accounts. On the web, people would be able to pay for access to content or other products without leaving the website or game by using an embedded payment banner. The Google Wallet model allows people a 30-minute “Instant Refund” where customers can opt out of their payment if they decide the product isn’t desired. In Google’s case, “the payment flow is ideal for selling premium digital content that’s superior to the free alternatives.” Google takes a 5% fee for each business transaction with the rest of the fee applied to the business’ account on a monthly basis. Location-based app software uses apps called “card cases” that allow you to use your phone as your credit/debit card by moving your smartphone near a receiver on the vendor’s terminal, which is equipped with a location proximity server. Near-field communications (NFC), used by Google Wallet, is a short-range wireless technology that allows you to tap a similarly equipped device to exchange information using smart tags, which use a special chip in your phone. Smartphone credit card readers attach to your smartphone and let you swipe someone’s credit or debit cards to pay you for some product or service, allowing anyone—even vendors at a garage sale, flea market, or farmers market—to expand their range of payment options. SMS-based payments and transfers don’t require a smartphone. You send a text message with an authorization code, amount, and the recipient’s name to transfer funds. This has been very popular in developing countries. Software-based solutions, such as Google Chat, Google Talk, and Starbucks, allow you to use text messages to authorize payment transfers, which is also popular in developing countries. Has the ‘Mobile Payment War’ Begun? A news posting at CIO.com asks where the entrance of both Google and Apple into the micropayments arena represents a war in which Apple, Google—and others sure to compete as well—will take on traditional banking systems for control in the new cloud-based financial system of the 21st century. So far, each is still feeling its way in what may be a nascent market or another failed venture. In its May 2011 product demo, Google described Wallet as “an open commerce ecosystem.” Given the potential for not only creating high profits but also for upsetting existing financial/banking systems, nothing can be assumed to be truly “open” today. The success of either product—and micropayment systems in general—will depend on the degree of cooperation it can achieve with businesses. Google Wallet and Apple Passbook both have some vendor partners lined up, but these represent a very small fraction of the business sector in the U.S.—let alone the world. Mozido, LLC’s executive chairman Richard Braddock was recently quoted as saying, “In 2011, there were 6 billion mobile phones in the world, almost 3 times higher than the number of internet users. In 2016, we expect 8 billion mobile phones, compared to 3.4 billion internet users. In 2016, the mobile payment market is projected at $617 billion in transaction value, compared to only $105.9 billion in 2011.” Clearly any company with an edge in this area would be interested in establishing a foothold. In the near term, there are too many hurdles to see any quick change: Most people still don’t have usable smartphones that would be critical to using the systems; businesses would need to upgrade their checkout terminals for these platforms and multiple input systems; and the industry needs to establish clear data security policies and standards to guarantee the integrity and safety of these systems. At this point, micropayments promises to be a transition, at least in the U.S.
Later this month, Isis Mobile Wallet is expected to launch as another alternative Android-based micropayment system. Isis is rumored to be able to work on a larger range of smartphone platforms—AT&T, T-Mobile, and Verizon—than the Google Wallet. However, rumored features and information don’t seem to clearly differentiate the two products, with both designed to work on terminals employing NFC. Clearly, the stakes are high. Last month, VISA CEO Joseph Saunders was asked in USA TODAY about the sea changes taking place: “If you had asked me 10 years ago where we would be today, I can’t fathom how I could have answered you, because to me, it’s been an explosion.” The coming decade will be just as uncertain to predict. However, it is clear that the future is mobile. This product creates a passbook pass for each credit/debit card and allows the user to important information at a glance such as balance and alerts for suspicious charges (the core security product developed by BillGuard). This also shows that Apple's passbook has a lot of promise in the M-payments field.